Dubai is where cultural traditions meet competitive modernity. Dubai is where cultural traditions meld harmoniously with a sense of competitive modernity that continues to impress the world. Lightning-fast hyperloop trains, the record-breaking Burj Khalifa, and life-sized robocops are just some of the futuristic feats this superlative-craving city has come up with. All of these are set amidst a backdrop of a vast desert where camels and Bedouin families still roam. For travelers looking for a unique experience, the possibilities are endless. Take to the skies on a hot air balloon, go theme-park hopping, or roam the deserts on a 4x4, there’s always something exciting to do if you know where to look. Here are some of the best things to do in Dubai. 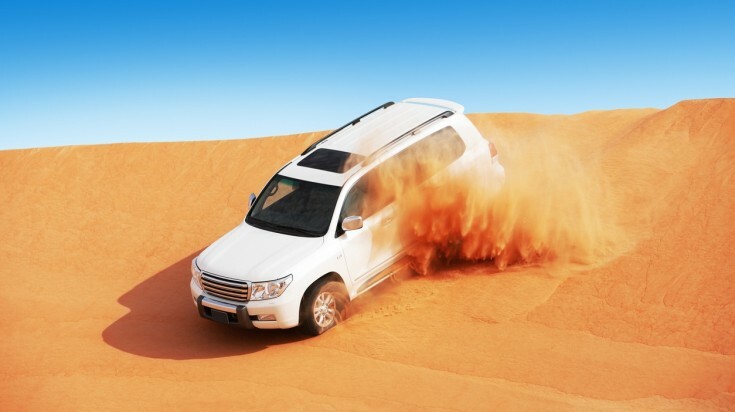 Dune bashing is a popular activity in Dubai. Visit the desert and ride a camel. If you’re wondering what to do in Dubai, never miss out on a desert safari. The fun is in choosing how to conquer the Arabian Desert! Take a high-octane drive on a 4x4, perch on the back of a camel for a more relaxed ride while spying on Arabian gazelles and Oryx, or go sandboarding, quad biking, or dune buggy riding. Most desert safaris culminate with a delicious barbecue dinner amidst Bedouin-inspired makeshift camps while fire and belly dancers entertain you. Top tip: Choose the best time to go. Day time during summer (April to October) can get very hot, while evenings can get quite nippy. Bring a light jacket for evening safaris and don some sunglasses to keep sand off your eyes. 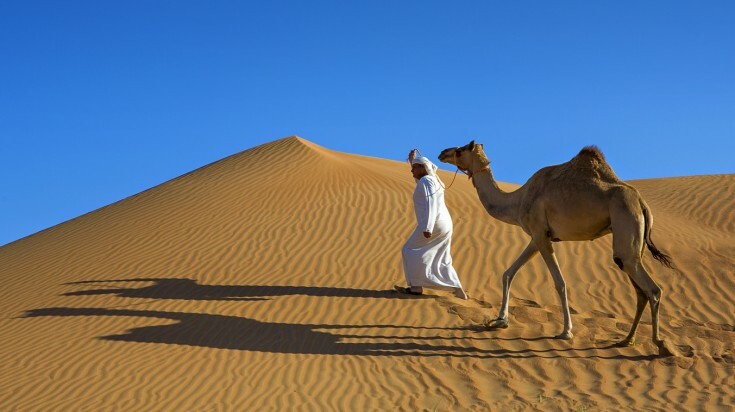 Check out our travel guide on Ultimate Guide to Desert Safaris in Dubai for more infomation. Burj Khalifa lighting up the evening sky. Burj Khalifa Lake as seen from Burj Khalifa. 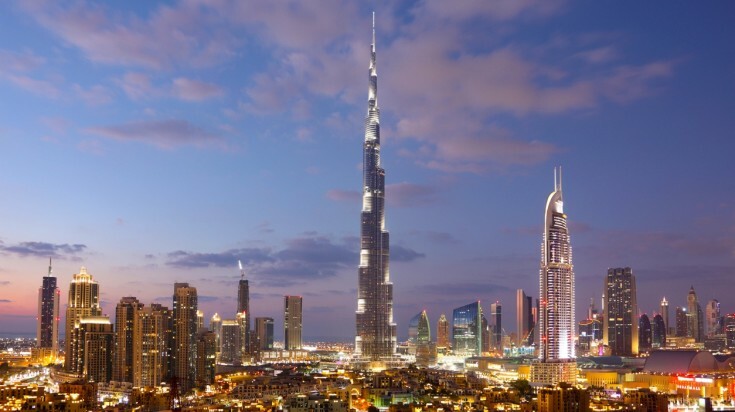 Apart from being the tallest building in the world, the Burj Khalifa is also Dubai’s most popular tourist destination. A true global icon, this 828-meter superstructure is a feat of engineering. If you’re looking for unmatched views of the city, there’s no better place to get them than in this architectural wonder. A number of observation decks are available for tourists — level 148 offers the highest views with an outdoor terrace and a premium lounge; level 125 and 124 offer 360-degree views of the city, and the former offers a tribute to Arab culture and arts while the latter comes with an exhilarating outdoor terrace. 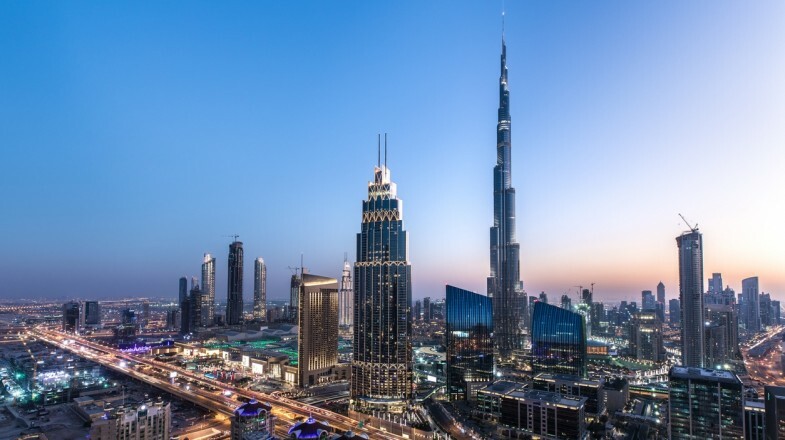 Top tip: The Burj Khalifa is next to a plethora of entertainment and dining options, so you won’t run out of things to do before or after visiting the observation decks. The mammoth Dubai Mall is located close by, as well as the musical Dubai Fountain. 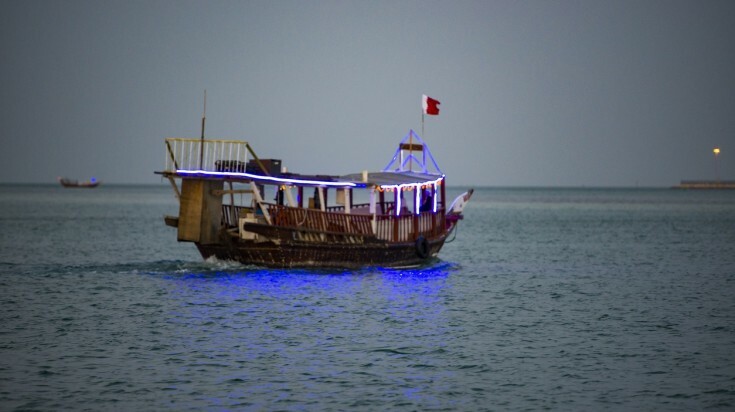 Taking a Dhow Cruise in Dubai is one of the most authentic experiences of Dubai. Dhows are traditional wooden boats crafted by local fishing communities to navigate the Indian Ocean and the Red Sea. Today, they are one of the best ways to explore the Dubai Creek and the Dubai Marina. Replete with culinary and entertainment amenities, going on a Dhow Cruise offers a unique sightseeing experience that’s definitely one of the top things to do in Dubai! The Dubai Creek offers a charming look at Dubai’s Old Town, while Dubai Marina features towering skyscrapers and some of Dubai’s finer architecture. Feast on lavish buffets while being serenaded by song and dance performances! Top tip: Dhow cruises can have rates that range between USD 11 to as much as USD 123*. Lower end cruises cover most of the basics, but the more expensive cruises offer more luxury amenities and services such as hotel pick-up and drop off. Check out our ultimate travel guide on Dhow Cruises in Dubai for more information on a Dhow Cruise tour in Dubai. The Dubai Fountain offers spectacular shows daily. 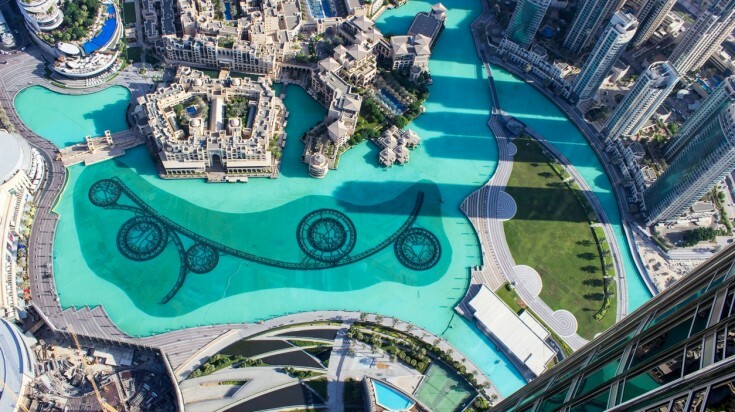 Even in the league of fountains, Dubai is one to beat. The Dubai Fountain, set on the Burj Khalifa Lake in Downtown Dubai, is the world’s largest musical fountain. The massive choreographed water show features powerful jets that can shoot water up to 150 meters — roughly as high as a 50-storey building. 50 color projectors and 6,000 powerful lights add even more drama to the already breathtaking show. The Dubai Fountain is the best place to visit in Dubai for its performances, which are free and held daily. The waterworks may be witnessed from various locations around Downtown Dubai. The show is accompanied by music ranging from pop to classical including hit songs from Michael Jackson, Whitney Houston, Lionel Ritchie, and Elmer Bernstein, among others. 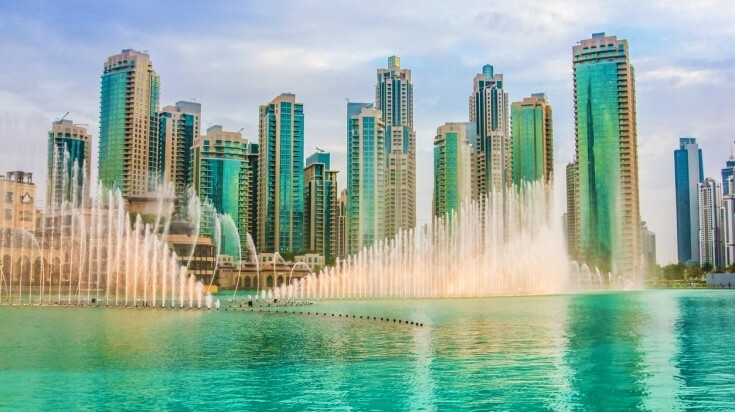 Top tip: For best views of the Dubai Fountain, head to the Waterfront Promenade located right by Dubai Mall. Minutes before the performance, thousands of people flock to the area for front row action. Come early to bag the best spots! From skittering through Old Dubai on a traditional Abra to gawking over the Dubai Marina skyline on a luxury yacht, riding a boat is one of the best things to do in Dubai to soak up the sights. Sailing atop a Dubai Abra is the cheapest way to explore the city on water, but if you’re looking for a more leisurely exploration with a relaxed pace, opt for the yellow boats that offer 45, 75, or 90-minute tours. The longest tour takes you all the way to the Burj Al Arab, the Palm Jumeirah, and the Marina. Top tip: Most boat tours happen in the morning or early afternoon when the sun is at its highest, so be sure to slather on some waterproof sunscreen! If you are looking for a boat tour in Dubai, try this 75-minute Atlantis Tour or this 90-minute Private Boat Tour. Dubai has a knack for making the most ambitious projects happen, so when it comes to theme parks, you just know they’ll be pushing the envelope. With an aim of becoming the theme park capital of the world, Dubai is home to some of the world's groundbreaking theme parks. IMG Worlds of Adventure is as big as 28 football fields and is the world’s largest indoor theme park; Legoland Dubai features 15,000 Lego models; Motiongate Dubai features 27 rides inspired by 13 animation and action films, while Bollywood Parks pays homage to India’s vibrant Bollywood film industry with 16 rides and attractions. Dubai is an adventure playground with theme parks catering to every interest! Top tip: Dubai Parks and Resorts is the city’s amusement park district located in the southern suburb of Jebel Ali with a bunch of established water parks, a Polynesian-themed hotel, and a bustling dining and shopping strip! When it comes to being a shopping, Dubai is one of the world’s frontrunners. When it comes to being a shopping haven, Dubai is one of the world’s frontrunners. This city is so shopping obsessed that it has built the world’s most gargantuan mall — The Dubai Mall. Other malls like the Mall of the Emirates, the Dubai Marina Mall, Dragon Mart, and The Outlet Village Mall are just some of the most popular shopping complexes the city has to offer. From luxury items to flea market finds, to a bustling spice market and a traditional textile souk, there are more ways than one to splurge in this shopper’s paradise. Top tip: The Dubai Shopping Festival, one of the most awaited events in the city and the largest shopping festival in the world, is an annual month-long fest where shoppers can find deals on fashion, electronics, and accessories, among others. Shop while watching live concerts, fashion shows, and firework displays! 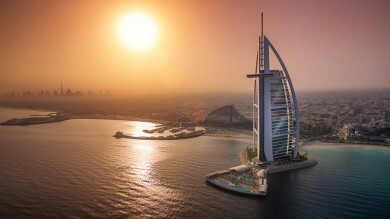 Sunset Beach is a great place to take a walk in the sand with Burj Al Arab in the backdrop. Water lovers rejoice! There is more to Dubai than dried up desert dunes. If you’re looking to wade in crystal-clear waters, Dubai’s beaches will not disappoint. Sunset Beach gives you a spectacular view of the Burj Al Arab while walking along fine stretches of sand; The Beach by JBR features a host of fashionable boutiques, juice bars, and burger joints; Kite Beach, hailed as Dubai’s sportiest beach, is popular for kite-surfing, stand-up paddle boarding, or kayaking. There’s so much to explore for sun lovers! Top tip: La Mer, located at Jumeirah 1, is one of Dubai’s newest beachside destinations. Check out its exceptional cafes and restaurants, boutiques, and the outdoor trampoline park! 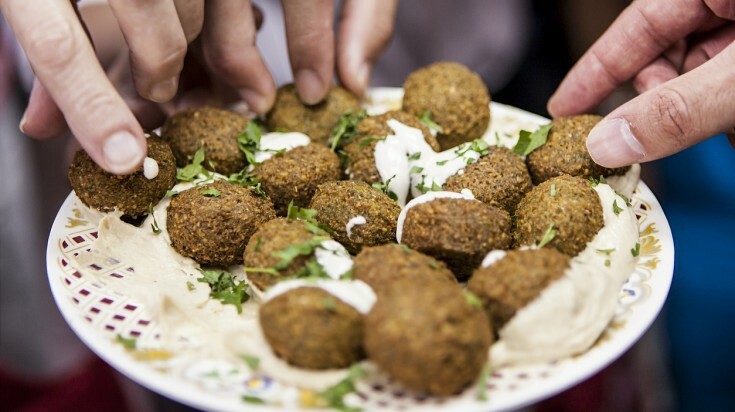 Falafel is a common street food found in Dubai. Dubai’s rich culinary scene is a melting pot of different cultures around the world, but the undoubted favorite in this culinary landscape is Middle Eastern cuisine — rich, spicy, herbal, and pungent. When in the city, don't forget to try out hummus, everyone's favorite dip made from chickpeas, olive oil, and garlic. Manakish is a delicious pizza-like flatbread topped with cheese and spiced minced beef. Falafel is a common street food — fried balls made from ground fava beans or chickpeas. And of course, the world-famous shawarma — tender strips of meat wrapped in a flatbread with hot sauce, vegetable, and yogurt. Top tip: For Dubai’s best street food, check out Bur Dubai, the city's oldest neighborhood. Here, streets in Meena Bazaar are crammed with shops selling authentic Indian street food like biryanis, curries, samosas, bhaji, and pakoras. Check out this day tour to enjoy a dinner in the deserts in Dubai. 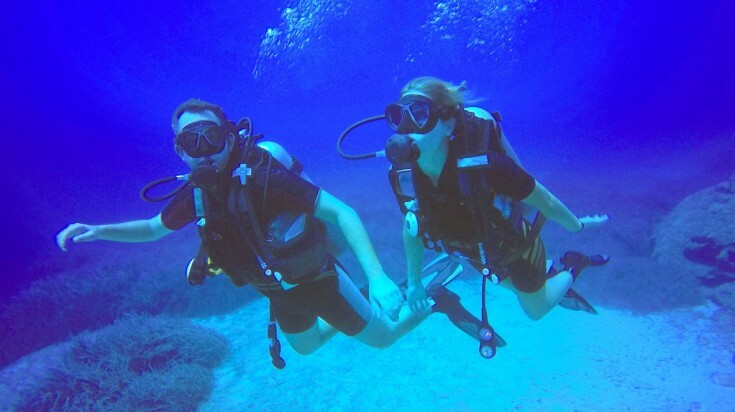 Discover the marine life on a scuba dive session. Dubai has more than 50 kilometers of coastline, making it a great destination for water sports of various types. Go scuba diving with a qualified team of PADI Instructors, ride the Seabreacher, a shark-shaped submarine that reaches speeds of up to 100kmph, try Flyboarding, a one-person water propelled hoverboard that reaches heights of up to 9 meters, or go wakeboarding, parasailing, tubing, kitesurfing or paddleboarding. When it comes to variety in water activities, Dubai is a tough one to beat. Top tip: Looking for a unique experience? Aquarium Diving at Atlantis, The Palm, allows you to get up close and personal with around 65,000 marine animals. If you’re raring for something more adrenaline pumping, try the Underwater Zoo with Al Boom Diving and Shark Encounter at Dubai Aquarium — both experiences involve sending you underwater on a protected cage while sharks swim just inches from you! Flamingos flock near the waters during winter in Ras Al Khor. 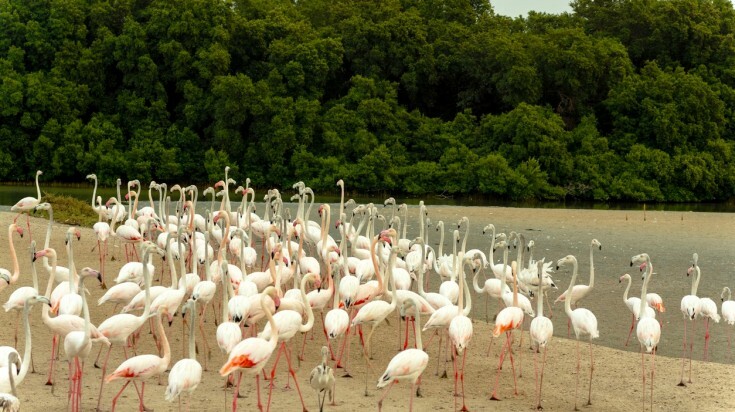 Heed nature’s call by heading over to the Ras Al Khor Wildlife Sanctuary just meters away from Dubai. More popularly known as the “Cape of the Creek”, this verdant 6.2 square-kilometre wildlife sanctuary features mangroves, salt flats, lagoons, and intertidal mudflats that serve as natural habitats for a host of birds. In the morning and afternoon, three bird hides are available for public access. Spy on great egrets, grey herons, black-winged stilts, osprey, sandpipers and more. Top tip: You’ll be able to witness a plethora of birds in Ras Al Khor Wildlife Sanctuary, but during the winter, it’s the pink flamingos that truly steal the show. The flamingo population reaches a peak during cold months and wanes during hot weather as they fly to other countries. Fly in a hot air balloon over the desert in Dubai. Gawk in awe at the vastness of the Arabian Desert 1,219 meters off the ground. A hot air balloon tour gives you the best views of amorphous sand dunes during sunrise, just when the environs are bathed in golden yellow while desert-dwelling creatures roam about. If you’re aiming for the most Instagram-worthy pic of your Dubai travels, this is the perfect photo opportunity! Most hot air balloon tours end with a delicious Arabian breakfast to cap off the experience. Top tip: Make sure your camera comes with a strap to avoid accidental dropping. Staring at the horizon during sunrise can hurt your eyes, so views are best appreciated with sunglasses on. 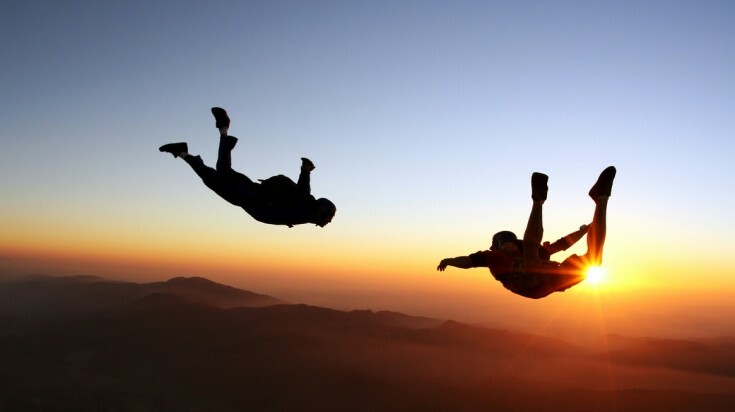 Sky diving is a fun thing to do for the adventurous soul. 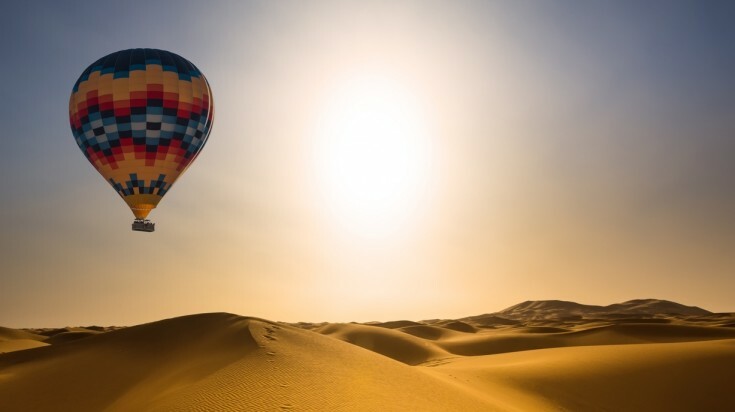 A hot air balloon allows you to explore Dubai at a leisurely pace, but if you’re the adrenaline-craving, daredevil type, plummeting to the ground from a plane 3,962 meters over a desert might be more your thing! All skydiving activities in Dubai are managed by Skydive Dubai, a company that holds several Guinness World Records. Choose from two skydiving locations: the Palm Drop Zone or the Desert Campus drop zone. The former gives you splendid views of desert dunes, while the latter offers a breathtaking scenery of the magnificent man-made Palm Islands! Top tip: If diving from 3000 meters is not your thing, or you are short on time, a perfect alternative to skydiving is indoor skydiving. You can experience the feeling of free fall in a controlled stimulation. Visit the old district at Al Fahidi. Don't let the futuristic sites and high-octane activities make you miss one important fact — Dubai is a city rife with history. There is an assemblage of museums, historical treasures, and heritage areas in the city that will take you on a trip to the past. Learn about Dubai's pearl-trading industry and Bedouin culture at the Al Fahidi Fort. Get the lowdown on Emirati culture and heritage at The Sheikh Mohammed Center for Cultural Understanding, or discover how UAE was formed with a trip to the Etihad Museum. Dubai has a plethora of enriching historical experiences for you to try! 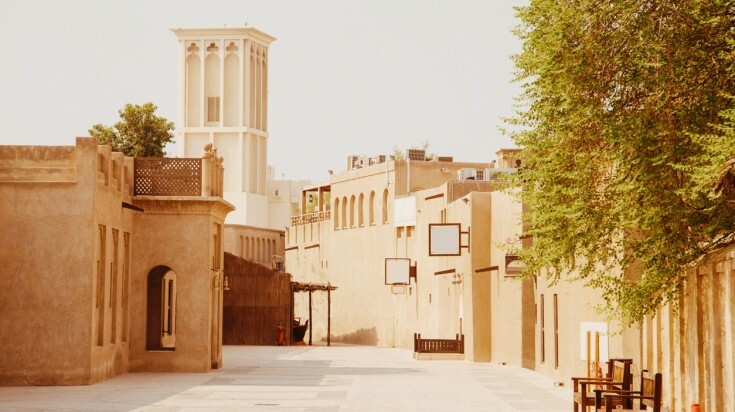 Top tip: Dubai’s Old Town is a great place to get acquainted with the city’s history. Learn about Arabic Culture at the Dubai Heritage Village, explore the city’s ancient souks, or ride a traditional abra for a historical ride along the Dubai Creek. Visit Dubai Museum and Al Fahidi Fort with this tour. 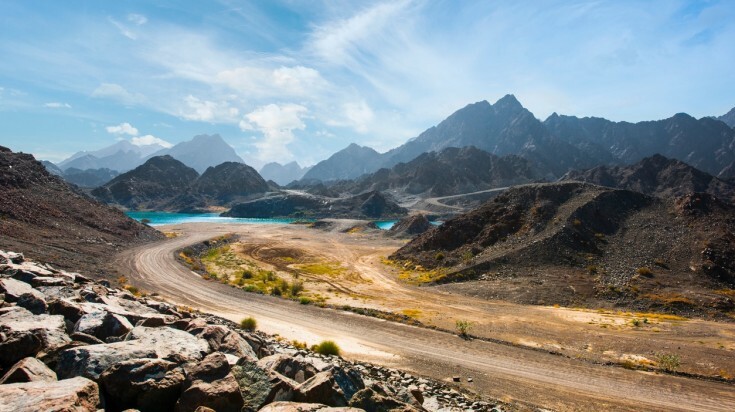 The Hatta mountains are located just two hours' drive from downtown Dubai. Adventurers, nature-lovers, and mountain bikers behold! The craggy mountain peaks of Hatta offer lots of activities for travelers looking for the next adrenaline rush just outside of Dubai. Located high in the Hajar Mountains, just two hours’ drive from Downtown Dubai, the untamed environment of Hatta is a playground for mountain bikers. Four levels of mountain biking trails offer varying difficulties but be forewarned, even the easiest routes can be tough! More the nature-loving type? Rough it up with a hike through the Hajar Mountains, where undulating peaks and troughs ensure you’ll be sweating it out. If you’re looking to mellow down, head to the Hatta Dam for kayaking, water biking, or cruising along on a yellow boat. Top tip: Short on time but want to get the most adventure out of your trip? Head to the Wadi Hub — an outdoor adventure center with eco-friendly lodges and trailers available for booking. The Wadi Hub is still under development, so some activities are unavailable. However, travelers can try archery, zorbing, mountain biking, and the net walkway! Dubai Frame is the newest addition to Dubai's skyline. When we said that Dubai had a knack for superlatives, we weren’t kidding. 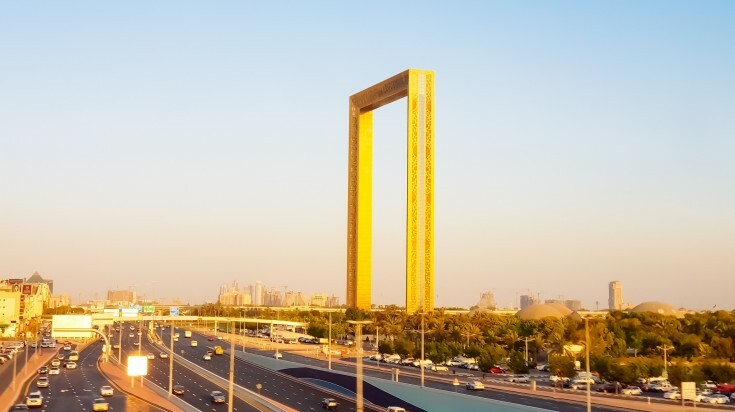 The Dubai Frame, a mammoth 150-meter-tall picture frame-shaped structure, is a true architectural marvel which offers breathtaking panoramic views of the city. With a camera, it’s easy to capture sweeping views of Deira, the Arabian Desert and the skyscrapers of Dubai Marina. The two parallel towers are connected at the top with a 93-meter long bridge featuring a 25 square-meter glass panel. Walking across this bridge feels like walking on thin air! Top tip: Learn about Dubai’s history and continued evolution at the mezzanine level, where an immersive gallery tells a story about Dubai’s transformation from a fishing village to a thriving metropolis, complete with projections, audio-visual presentations, curated scents, and mists. Dubai after-dark is a playground for party animals. Whether you’re looking to dance all night, sip on rooftop cocktails, or brush shoulders with beautiful people at a beach club, the fun factor in this party-loving city is off the charts. WHITE Dubai, one of the top 20 nightclubs in the world, is an open-air superclub that hosts some of the hottest DJs. For bar-hopping, head to Soho Garden, a complex made up for four bars and clubs. Hobnob with the rich and fashionable at the Cavalli Club, an OTT lounge inspired by fashion designer Roberto Cavalli. Top tip: Tourists are allowed to drink alcohol in certain venues in Dubai, but being drunk in public, especially driving while drunk, is a big no-no. Be on your best behavior to avoid being fined, or worse, jailed. As a coastal city, Dubai offers some of the best fishing experiences with its thriving fishing culture and community. Deep sea fishing might be underrated, as visitors tend to focus more on the events, bars, shopping, and theme parks that Dubai has to offer. However, if fishing is your hobby, deep sea fishing is definitely one of the best things to do in Dubai. Hire a charter and stand a chance to catch kingfish, hammour, barracuda, sharrie, or sultan Ibrahim. Top tip: The more you travel further offshore, the wider the variety and the bigger the fish you’ll catch. Dubai offers some of the best fishing tours available, with an experienced captain and crew who can point you out to the best spots. Skiing is definitely one of the top activities in Dubai that you shouldn’t miss. Trust in Dubai to create the world’s largest indoor ski resort — the massive and locally popular Ski Dubai. Located at the Mall of the Emirates, Ski Dubai is 22,500 square meters of indoor ski area where you can snowboard, ski, toboggan, take a ride on a chairlift, and zip line, among others. The ski resort also comes with a Snow Park, where you can explore an ice cave, roll inside a giant zorbing ball, or start a snowball fight. Top tip: Don’t forget to check out Ski Dubai’s resident penguins! A colony of Gentoo and King Penguins put up a 40-minute show for guests every day, with a chance for an up-close encounter for lucky visitors. Take this tour to experience skiing in Dubai. Raring to hit the green? Dubai’s got you covered. The city is home to 3 of the world's top 100 golf courses and offers high-quality fields for both beginners and professionals. From beachfront golfing to desert golfing, the quality and diversity of Dubai's golf courses are world-renowned. Today, there are around 12 courses scattered in the city, all with a host of attractions and restaurants to keep you occupied when you're taking a break. Top tip: Three of the world’s major European tour events are held in Dubai: the Omega Dubai Desert Classic, Omega Dubai Ladies Masters, and the DP World Tour Championship. Adventure-seekers who venture off the beaten path will find out that these are just some of the best things to do in Dubai. This innovative city is always creating something new and exciting for their visitors, so look forward to more experiences to include in your itinerary!